A child is a mass of curiosity. And the dictionary is a spring of knowledge. 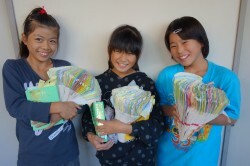 "Jishobiki" was invented to stimulate this curiosity and to have fun and acquire knowledge. 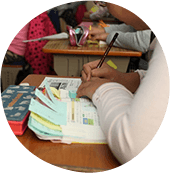 No special teaching materials are necessary to get started. 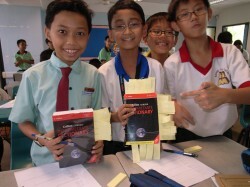 You can start with a dictionary and sticky notes that suit your child. About seven years old is the best. If you can understand and write the alphabet, you can do this learning method. 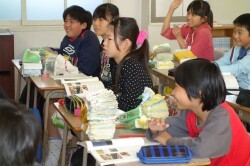 Of course junior high school students and high school students can tackle Jishobiki. 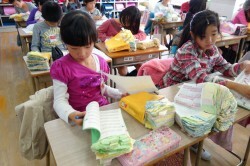 However, primary school students, especially small children, will be happy to undertake this learning method. 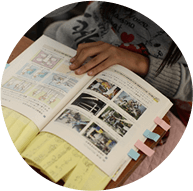 When starting Jishobiki, first grade elementary school students also enjoy and come to use this method more than even second or third grade students. 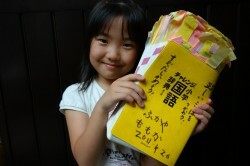 By doing Jishobiki, children can learn to practice spontaneously. Children should use a fun dictionary with illustrations even though it is for reading. Parents and teachers are encouraged to choose something for their children that is large in size and easy for children to read. 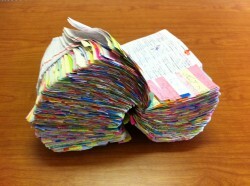 Children and parents should place their dictionaries in places where children can easily pick it up. If a child wishes to look something up in a dictionary in everyday life, if the dictionary is stored in a bookshelf, the motivation to investigate will decrease. Please fill out more than the number you plan to read in the dictionary. 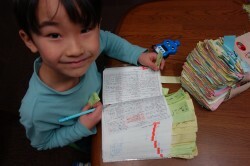 By numbering the sticky notes, the child can know how many he or she has read. Parents and teachers should help the child to find already known words and favorite words freely. step.03Paste the sticky note in the dictionary. When the child finds the word he or she knows, the child writes the word found on the sticky note and sticks the sticky note to the top of the dictionary. If the child finds the word, writes the word on the sticky note and pastes it in the dictionary, please give them praise. Children will be proud of themselves because they can see a lot of tags and check their own efforts. This aids in a child's confidence. I think Jishobiki is a very easy method. Do not ask for perfection in expecting all meanings to be read when searching for words. Parents and teachers should refrain from intervention even if it takes time to search. When praising, rather than pointing out wrong things, please praise the child’s improvements. Please also be interested in what kind of words have been found. Also, do not give excessive rewards. By showing an excessive reward, the main purpose becomes earning the reward. The most important purpose is to have children feel the joy of learning voluntarily. flow03Let 's have more fun using dictionary. If the child gets used to finding words, please do a dictionary quiz and ask them to find words based off of the meaning. By doing so it leads to being more interested in the meaning of the word that has been searched for, create an opportunity for children to present found words, and more awareness raised. Let's turn our eyes to the effective use of the dictionary. Gradually when the child does Jishobiki, he/she can not be satisfied with just the information in the dictionary, but will look to other sources as well . Please encourage him/her to look it up in an encyclopedia or an illustration. 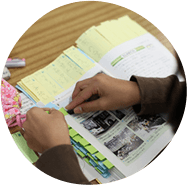 There are many effects in dictionary subtraction learning. As a child draws a dictionary, the frequency of viewing the words increases, thereby improving vocabulary skills. The motivation for children to want to know more increases. 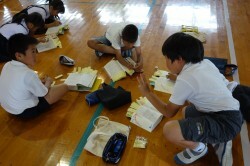 By examining the dictionary, they can feel the pleasure of satisfying that feeling and learning. By looking it up in a dictionary, you are able to find answers by yourself. 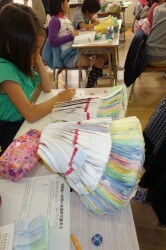 ④Children will be able to find answers themselves by Jishobiki. ⑤Parents and children, exchange between teachers and children increases When a child is doing Jishobiki, please ask what and how much the child has examined. When your child makes a new discovery through Jishobiki, please listen to them. Adults have many things to learn from a childlike awareness. As a result, opportunities for parent-child exchanges increase. Please enjoy Jishobiki with your children.